TAG watched with pride, as the Freestage rocked to the sounds of the Rhythm Sticks, at one point feeling transplanted from the cold, grey concrete of the immediate surroundings to a vibrant, many-coloured jazz hang out in the deep south. As the Blockheads lyrics suggested, we were among many felt compelled to 'Move their body to and fro'. 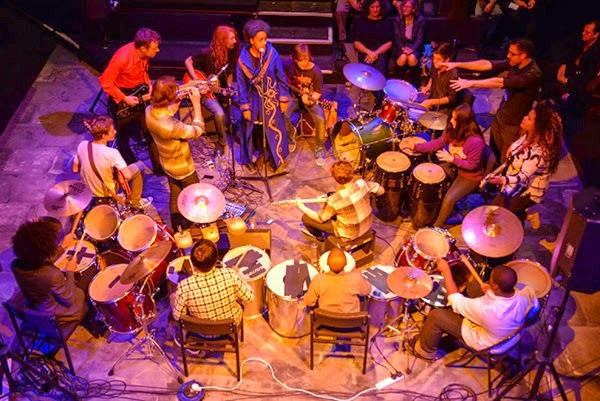 From their humble beginnings, in 2008, North London's cutting edge youth ensemble Rhythm Sticks have rapidly become a tour de force. Masterminded by Andrew Plummer from World Sanguine Report and drummer Tom Greenhalgh, what began as an after-school music club at Tottenham's Park View chool, has developed into a unique sound, one which fuses many musical influences, set against a foundation of 'eccentric improvisation'. Their musical output is entirely their own, via a collective melting pot of original material. With a name taken from seemingly elementary music-making components, this percussive provenance sits well. From such simple beginnings, rare artistic excellence can often come about. Further anomaly lies in this band's origins - as well as the Barbican, the Rhythm Sticks have performed at Jazz On 3's Jazz In The Round at The Cockpit Theatre, the Vortex Outdoors Festival; have been played on BBC Radio London; won two awards at the 2012 National Music-For-Youth Festival - these moments seemingly some distance away from an area of North London which only hits the headlines through adverse news stories. Yet scratch the surface, and Tottenham provides an entirely optimistic back beat. Using Kickstarter as a funding mechanism, Rhythm Sticks, in partnership with Good Move! 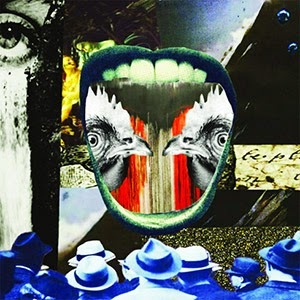 Music, were able to record a debut nine-track album entitled The Hen’s Tooth. Officially released at The Barbican gig in 2013, this astonishingly polished production fuses diverse musical influences, providing a refreshing antidote to the anodyne output of their music industry peers. For, despite their current age group, this ensemble create a sound of rare maturity. Perhaps this is the nub - much like the punk explosion of the mid 1970s, it takes a counter-culture evolution to bring new light. And just as the raw, hard-featured shell of an oyster can fashion the rare, multi-layered beauty of a pearl, so too an urban inner city corner of Tottenham create musical excellence of similar rarefaction. As the Rhythm Sticks album and title track suggests, what seems impossible to obtain can sometimes come about. And as unlikely as a handicapped, bohemian misfit anarchist from north London getting a number one hit, through music we can defy the odds. Toothed hens can lay golden eggs. For the third instalment in our 'in The Frame' program, TAG are proud to have enlisted two artists whose work graced the Rhythm Sticks first album - band member Fionn McGuinness Maris (who co-wrote the Hen's Tooth track), and Melissa Gardiner, an artist who created the album artwork, and this special collage for our exhibition space. What do you find appealing about collage as a medium for producing art? Collage is captivating for its ability to dismantle and integrate a series of images to create something new. Every image used comes with different colours and depth, which introduces a whole other dimension of abstraction. I find this is something painting could fail to achieve. Using collage is almost an alternative for me to express my creative side. Since I don’t paint or draw as much as I create collages, scrap images become a crucial, pictorial element in my works as paint would do for an artist. Are there artists who have influenced your work? My works are primarily inspired by artists such as Beth Hoeckel, David Delruelle, Alexander Rodchenko and even Surrealist artists like Max Ernst. Do you use traditional scissors and knife methods, or are the artworks you create digital compositions? I occasionally use the scissors and knife method depending on my supply of images from magazines. Most of the time my works are digitally based since its more convenient to manipulate size, quality and even alter images to match certain demands. 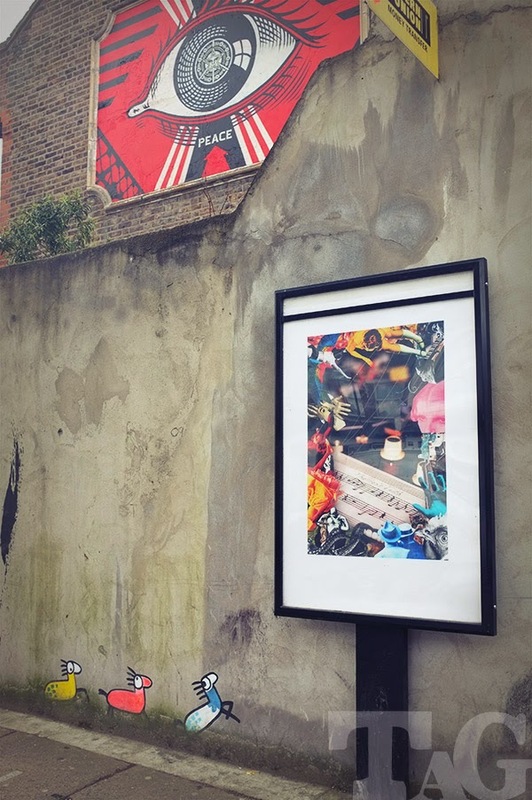 Describe the process you used to create the border artwork for our 'in The Frame' commission. Firstly, I collect images from different sites or even magazines, and start cutting around the selected images on photoshop. I then adjust the size and create different layers so they all overlay one on top of the other and then manipulate its position so it frames the outskirts of the image. Do you intend to pursue a creative career? I do hope to continue making album art, but in the meantime I hope to pursue a career in curating or working in a gallery. How did you get involved with the Rhythm Sticks Hen's Tooth cover artwork project? What was the brief? 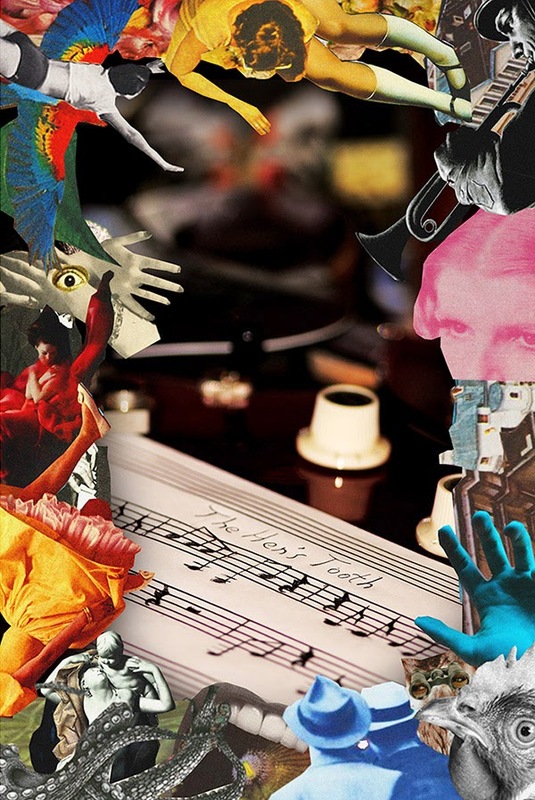 When I heard Rhythm Sticks were making an album and were in need of some artwork I thought it would be a good opportunity to put my collage skills to the test and incorporate it into an album piece. It was important to me to reflect and condense their musical creations into a work of art. I thought they would have wanted something quite surreal to match their equally eccentric music. What would be your ideal artistic challenge? I would love to devise a three dimensional collage piece that appears to be emerging from the canvas it derives from; as well as something that is interactive and identifiable with the onlooker - that would be the ultimate challenge. How did the Rhythm Sticks project come into being? Rhythm sticks was founded about 5 years ago by Andrew Plummer and Tommy Greenhalgh as an after school music club for students in Park View. However, in it's early stages, it comprised an entirely different group of musicians and it is only in recent years that all of the current participants have come together to make music. What is your role within the ensemble? I am one of the lead guitarists. What are your personal musical reference points and inspirations? Well, I try not to obsess over particular artists so as not to imitate their style but I can't help but idolise some like David Bowie, Tom Waits and Marc Ribot. Some specific pieces of music that I draw inspiration from are 'Ziggy Stardust', 'Jockey full of bourbon' and 'For Malena'. Describe the creative process which resulted in the Hen's Tooth track. For the Hen's Tooth, I approached the band with a few guitar/bass parts that I had written and we then learnt and adapted them collectively. The instruments I hadn't written for either devised their own lines and/or imitated the guitar parts and the structure was decided upon once all of the sections were tight enough. Is a follow up album planned? Though it hasn't been formally discussed, I'm sure none of us would be opposed to the idea. We have a few new songs on the way, so it's not unlikely that rhythm sticks will be entering the recording studio some time in the near future. Given the Rhythm Sticks adherence to improv, is working within such a large ensemble of musicians a challenge? It is, at times quite a demanding task to improvise in front of an audience and those who have seen us perform will know that members of the band often have to do so at a moment's notice. I know I have felt daunted countless times when, without forewarning, I have found Andrew's decisive finger aimed directly at me in the middle of a performance, at which point I have had to try and pull notes out of the air and arrange them convincingly. However I think that the band offers a very supportive atmosphere and one that is conducive to improvement for aspiring improvisers. The adrenaline that comes from it is also almost addictive in nature, as is the applause that follows; so though it makes one become tremulous, it does so with both fear and excitement. As for the largeness of the ensemble, yes it can be difficult to know what or when to play but usually the band will adapt the music to allow space for the improviser, for instance by sitting out or getting quieter. Also, certain sections are often dedicated to improvisation, meaning they are inherently sparse and therefore good for noodling. Is now a good time to create music? Or is there an era which would have been your ideal? Well, for a while, nothing stylistically new has really become popular among young people and it feels like the time is opportune for something like that to make its way forth. It feels like formulaic rap and R and B songs are stagnating at the top of the charts and so I think perhaps something new would be appreciated right about now.